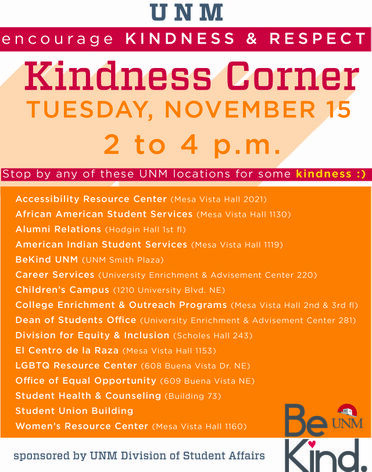 The University of New Mexico's Office of Student Affairs, along with numerous campuswide departments, hosts Kindness Corner Open Houses on Tuesday, Nov. 15 from 2 to 4 p.m. The open houses will be held across campus in an effort to encourage kindness and respect. 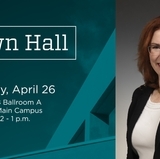 "There are a lot of emotions this week and we would like to emphasize the important message of kindness, integrity and respect on campus," said Student Affairs Chief Operations Officer Kim Kloeppel. 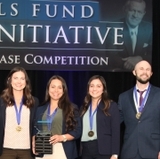 "We want students, staff and faculty to feel supported, safe and understand there are resources available for them. 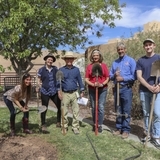 It is an opportunity to enhance and grow our Lobo Strong community." The following organizations will participate in the campuswide event to promote kindness and respect. 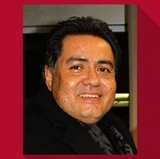 Also, watch a reated video from Vice President of Student Affairs Eliseo "Cheo" Torres.